One of the most appealing factors of Minecraft is the nearly infinite gameplay possibilities. Talented modders have taken this even further by making substantial improvements to Minecraft’s core game, adding awesome new features and helping to keep the game fresh and interesting without the need to shell out cash to Microsoft (though many mod authors do accept donations, so show them some love!). Minecraft has been out for nearly ten years, and while development of some mods has dropped off in that time, there’s still lots of great options to add some pretty neat stuff to the game. To use these mods in Minecraft, you’ll need to download an additional utility mod called Minecraft Forge. All mods we have spotlighted are compatible with Minecraft’s latest build, 1.12.2, but may also work with previous versions. Additionally, some mod authors offer specific installers for their mods which are compatible with previous builds. On Linux: In a terminal window, type "xdg-open ~/.minecraft" (or enter "cd ~/.minecraft" in commandline). OptiFine HD is a longtime favorite Minecraft mod and has certainly earned its place at the top of any “best mods” list. This mod adds substantial graphical updates to the game, focused on offering high definition textures which add a more realistic feel to those classic blocks we all know and love. You can also use OptiFine to optimize your Minecraft experience and boost your frames per second. There are tons of different customization and optimization tools packed into this incredible mod, and it’s easily one of our all-time favorites. Journeymap adds an incredible world map to Minecraft, which maps your world as you explore. In addition to providing the much needed map (and minimap! ), Journeymap will also mark monsters, villagers and other NPCs on the map, as well as caves and other destinations. You can also specify your own waypoints and share them with other players in your world. You can even upload your world map to the internet and allow other players to check it out in their web browser. All in all, an absolutely essential mod that especially comes in handy for multiplayer worlds. Minecraft Comes Alive adds a whole new immersive level to Minecraft’s gameplay by adding NPCs and updating villagers to add actual individuals with their own personalities. Instead of the same army of boring villager clones, you’ll instead and interact with custom-skinned NPCs with names and passive bonuses based on their personality traits. 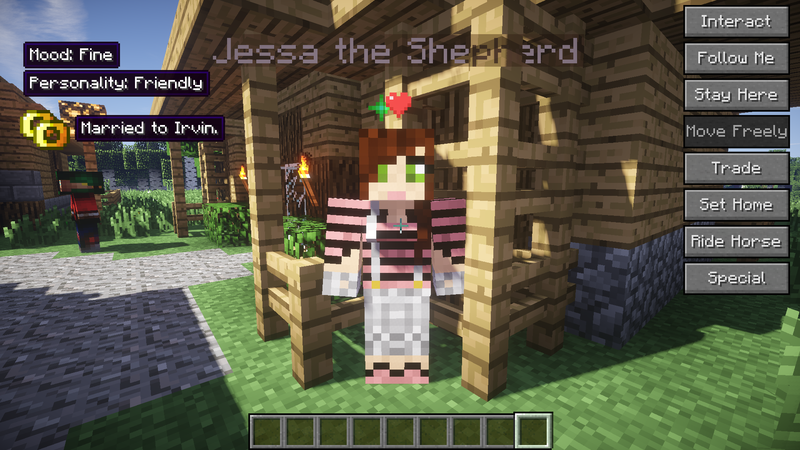 Minecraft Comes Alive also adds a relationship system similar to games like Harvest Moon and Stardew Valley, where you can get to know villagers through conversations and other interactions. Build your relationship up enough, and you can get married, start your own family, and put your kids to work gathering crops and helping with materials-gathering tasks. This addon also requires RadixCore in order to run. Chisel adds some fun new block options for those miners who also love to build! This easy-to-use mod offers a brand new tool, the Chisel, which offers access to tons of textured blocks, perfect for building themed rooms, factories, elaborate libraries, epic town squares and more. This mod is a great addition to the many awesome texture packs out there. It’s important to note that this mod requires CTM to function, so don’t forget to download and install both mods in order to get Chisel to work. Pam’s HarvestCraft is a massive mod, crafted lovingly over the past four years. 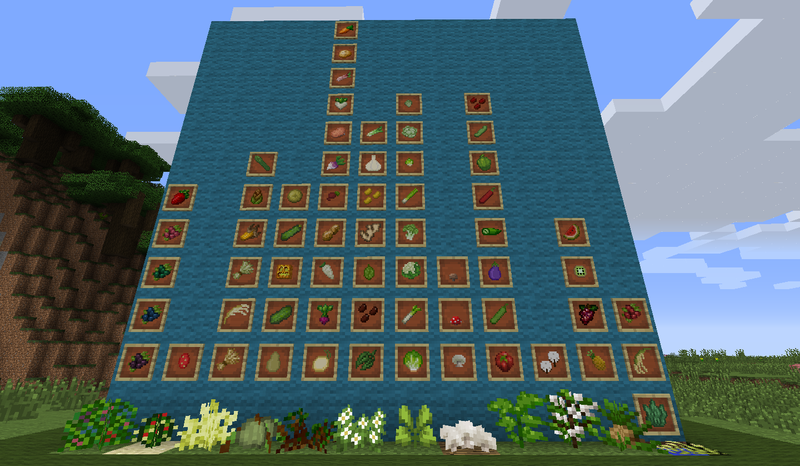 This mod adds approximately a bazillion new seeds, trees, crops, recipes, food items (and more) to Minecraft, which is a dream for players who love to focus on the game’s farming and gathering aspects. You can even raise bees for their delicious honey. If you’ve ever had a craving for Maple Candied Bacon, Cashew Chicken or some good ol’ fashioned Zombie Jerky, this is the mod for you! BiblioCraft is a wonderful aesthetic mod for library lovers out there, offering beautifully crafted new blocks In addition to giving players new options to craft, store, and display books, Bibliocraft also introduces armor stands and display cases, which can be used to show off your favorite armor sets, weapons and items. The bookcases in BiblioCraft aren’t just pretty to look at, they’re entirely functional and will show exactly which book is on a shelf in the same order it sits in the shelf’s inventory. You can even craft a Redstone Book capable of various levels of signal output! Inventory Tweaks is a great little addon that brings much-needed inventory management utilities to Minecraft. It adds easy, one-click sorting of items in your inventory and in chests. If you want to take organization to the next level, you can set up custom configurations to completely control how your items are organized. One of our favorite features is the “auto refill,” which will automatically replenish your hotbar using items from your inventory, in case you’ve consumed all of an item, or if your weapon or tool breaks. Minecraft already has its fair share of built-in biomes (36 in the Overworld alone, at last count), but the authors of Biomes O’ Plenty have decided the game needs even more! This mod adds over 75 new biomes, such as the beautiful Cherry Blossom Grove and the rare Mystic Grove, which is filled with purple water and enchanted trees. 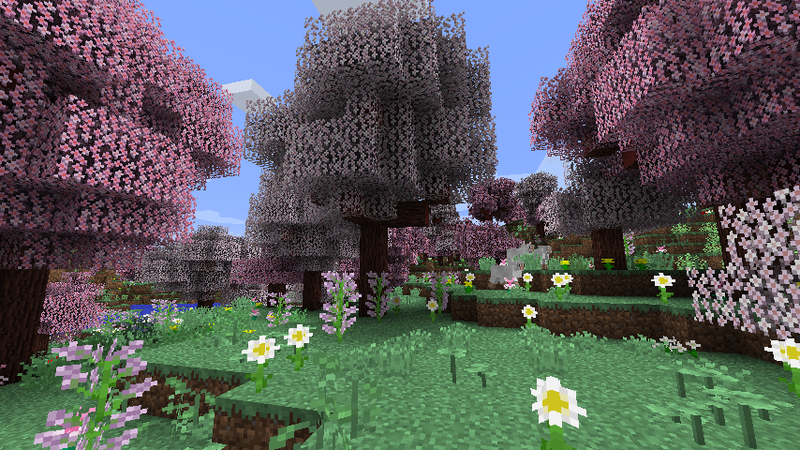 The addon features custom trees and blocks, along with a handful of new craftable items. If you’re looking to get started in a new world and love variety, look no further! Just in case adding fancy storage for books wasn’t enough, Storage Drawers adds fancy storage for everything through use of heavily customizable storage blocks designed to look like drawers. You can change the appearance of the drawers to feature different types of wood and stone, and set their interiors to support certain quantities of stacked items. You can even add indicator bars to a drawer to show how full it is. This can be super helpful when trying to keep an eye on your current stock of something important! Storage Drawers also offers more in-depth storage options, allowing you to network drawers and access them through use of Drawer Controllers to collect items from a shared inventory pool. Definitely a welcome alternative to hundreds of identical chests, wouldn’t you say? This addon requires Chameleon to run. Not Enough Items is another longtime favorite mod and, though its original developer has since left the project, it’s in the hands of a new developer who is still keeping it alive. This mod offers a full in-game catalog of blocks and items, including those added by other mods, and can be used to show the recipes for any craftable items. You can also view which items can be made by querying an individual block. It also offers a “cheat” mode which can be used to toggle Creative mode, spawn infinite quantities of blocks and items, place monster spawners, create enchanted weapons and more. Even if you don’t use the game’s cheat functions, Not Enough Items is more than enough for the in-game item catalog alone. You will also have to download both CodeChickenLib and Just Enough Items in order to use this addon.